What a joy it will be for kids to pretend they’re firefighters for a day at your child’s fireman birthday party. The following ideas will help you “wow” your party guests. Make your own firetruck birthday invitations. Prepare the invitation cards and draw a fire truck on the front, or use a fire truck coloring page (your child will help color the truck). Decorate your fire truck birthday invitations with firefighter theme stickers. For a different idea, you can take a picture of your child in a fire truck (or use Photoshop to make a photo collage). Have some fun with your fireman birthday party decorations. Cut out flames from red and yellow tissue paper and put them on the windows. Place yellow streamers first, then red ones on the outside. Decorate your firefighter party room with streamers and balloons in orange, yellow and red color. Draw firefighter hats on yellow construction paper. Then outline and hang them from the ceiling. Decorate your walls with posters of firemen in action, Dalmatian dogs, fire hydrants, fire trucks, etc. Spread any theme-related toys (e.g. fire trucks) or equipment (e.g. fire extinguisher) you might have around your fireman birthday party room. For tablecloth you can use a large city map and cover it with fire trucks and cars. (Or, you can cover your table with red table cover instead.) Have fire engine mylar balloon for a centerpiece. Greet your fireman birthday party guests with huge Firefighter Welcome. Provide them with fireman hats, stickers, etc. *Coloring Pages: For younger group of kids, provide crayons and coloring pages (firefighter theme) for them to color. 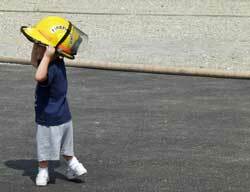 *Fireman Helmets: Explain to the kids that firefighters always clean their equipment. Give your guests rags or old towels – they must clean shine their fireman hats. Some firefighters might decide to decorate their hats with various items (e.g. stickers). Since they will take these hats home as favors, let them be creative. After they’re done, have them put one their helmets and take a group photo (when everyone arrived). Fire truck birthday party favors can include firefighter hats, badge stickers, small toy fire trucks, fire extinguisher squirt bottles, whistles, crayons, coloring posters, etc. *Pin the Badge on the Fireman: Change the classic “pin-the-tail” game. Get a poster of a fireman before the party. Draw and cut badges out of construction paper. Place a double-sided tape on them and put your guests’ initials on the badges. At the fireman birthday party, blindfold the kids one by one, spin them around and get them to stick the badge where it belongs on a fireman. Tape crepe paper pieces around party room to imitate flames. Next, hide animals in the area for kids to rescue. *Hot Potato: Have the children sit in a circle at the table. Have them pass (or toss) a potato around, while you play music in the background. As music stops, the person holding Hot Potato is out. Game continues until there is only one person left. *Fire Station Tour: How exciting it is for young kids to get to try real firefighter uniform and sit in a fire truck. You can phone your nearby fire station and check if they offer special visits, fire safety talks, or other events for children’s birthday parties (they usually do). Ask them if it’s possible for the kids to try on real firefighter outfit or seat in the front seat of the fire truck. *Fire Alarm Relay: For this fire truck birthday party game you’ll need: 2 boxes filled with firefighter uniform (helmet, long pants, and jacket), 2 strips of masking tape (about 15 feet each). First, set up 2 lines of masking tape, about 20 feet apart. Place 2 boxes with gear behind one of the lines. Second, divide your fire truck birthday party group into 2 even-numbered teams. Have them line up behind the second line. Have each team select one player to be the Fire Chief. The game starts on your command “Fire!” – the first person in each team must run over to team’s designated box, put on the gear, and race back to his or her team. The team members help remove the outfit and give it to the Fire Chief, who quickly returns it to the box. As soon as the Fire Chief gets back to the team, the next player races over, puts the outfit on, and runs back. The relay continues this way until everyone’s had a turn to race (except the Fire Chief, who runs the outfit back to the box, puts it on, and races across the finish line). The first team to finish wins! *Jump through Fire: This is a fireman birthday party activity for a younger group. Decorate hula hoops with orange and red paper streamers (to make flames). Get the kids to jump and hop through the hoops for super fun! *Tangled Fire Hoses: Have kids form a circle in your fire truck birthday party room. Get them to extend their left hand into the ring and grab someone else’s hand (not the person’s standing next to them). Next ask them to repeat the same with their right hands. The purpose of the game for the kids to untangle their “Fire Hoses”. They must try to accomplish this by twisting and turning, stepping over or ducking under others. Here is their chance to work as a team to solve the challenge, but whatever they do – they can’t let go of their friend’s hand. *Stop, Drop and Roll: Here is a fun fireman birthday party game that shows fire safety to the kids. Have music playing in the background. Kids can do dance moves or any other actions they like. Explain to the kids that when you stop the music, they must stop immediately whatever they are doing, drop on the ground, and roll several times to put out imaginary flames. Try the game several times and challenge the kids to go faster each time. *Balloon Toss: Since firefighters need to be around water, play this fun outdoor fireman birthday party game. Before the fireman birthday party, prepare water balloons (have 3-4 balloons per child). At party time, get children into pairs and let them toss water balloons. Put shaving cream on balloons to make catching them harder. *Fearless Firefighter Course: This is a great fireman birthday party game to play outdoors. Design an obstacle course. Have such items as narrow board to walk on, sawhorse to crawl under, large cardboard boxes to crawl through, table to run around, small rock (or pile of leaves) to jump over, etc. Have “young firefighters” test their skills, one by one, running through this course as fast as they can. (Don’t push the kids too hard, just encourage – this is about having fun!) For young kids of 3-4 years old, have follow the leader option – where adult can lead them through the obstacle course. If you play this firefighter party game indoors, you can use objects like boxes, wastebaskets, pile of toys, stack of books, etc. *Fire Truck Cake: This is an excellent fire truck birthday party cake idea (courtesy of Family Fun magazine). Bake 13- by 9- by 2-inch cake. Next slice the cake in four pieces (A, B, C, and D). Cut B in half horizontally to create E. Pile A onto D for the engine bed, B onto C for the cab, and E onto D for the control panel. Frost the control panel gray or brown, and the rest of the cake – red. Place a red M&M; in each of 6 chocolate sandwich cookies. Then press them onto to the truck for wheels. Place a pretzel ladder on top, gumdrop emergency lights, jelly bean horn, Chiclet headlights, and jawbreaker controls. Use twist licorice to add a hose and shoestring licorice for the windows. *Fire Alarm Chili: Heat 1 tbsp cooking oil in saucepan and add 1 lb ground meat. Next cook meat until brown. Stir in 1 glove minced garlic, 2 tsp cumin, 1 tsp chili powder. Cook on low heat for 15 minutes or until tender. Add crushed tomatoes (32-oz can), tomato paste (4-oz can), pinto beans (drained, rinsed from 16-oz can), and corn (16-oz can). Stir the mixture and bring to boil. Lower the heat and simmer until done. Have grated cheese or other condiments to put on top. *Siren-sicles: Mix 12 oz. cherry and 12 oz. white grape juice together. Fill paper cups half with the mixture. (You need to have enough paper cups, so each guest gets one.) Next insert Popsicle sticks into small banana slices and put them into each paper cup so the sticks stand up. Cut foil into small squares. Then make a slit through each foil square. Cover cups with foil allowing sticks to go through slit. Place cups onto baking pan (to avoid spills) and freeze for at least 4 hours. Then peel away the paper cups and foil – serve to your hungry fireman birthday party gang. *Smokin’ Smores: Here is a great fireman birthday party food idea. If you don’t have the real fire, you can use microwave. Put a spoonful of chocolate chips on half of a graham cracker. Then top with marshmallow (put on paper plate or towel) and heat in the microwave for about 1 minute. Next cover up with other graham cracker half and serve. *Flame Sippers: Combine 1 cup cranberry juice and 3 cups apple juice. Drop several cinnamon sticks into mixture. Bring “fire” juice to boil in saucepan. Simmer 5 minutes. Remove cinnamon and serve over ice. Have kids drink their juice using “fire hoses” (straws).